Scooper - Technology News: From Kigali to Kuala Lumpur: What will it take for Africa to follow South-East Asia’s development path? From Kigali to Kuala Lumpur: What will it take for Africa to follow South-East Asia’s development path? As the World Economic Forum turns from its regional meeting on Africa , recently convened in Kigali, to the ASEAN regional meeting in Kuala Lumpur , it is worth reflecting on the different development experiences of the two regions. And while it is always difficult to compare regions with very different histories, sizes and structures, it is worth reflecting on what African countries can take away from the growth experience of South-East Asia. Both regions are diverse, including higher income economies such as South Africa and Singapore as well as lower income economies like Cameroon and Cambodia. 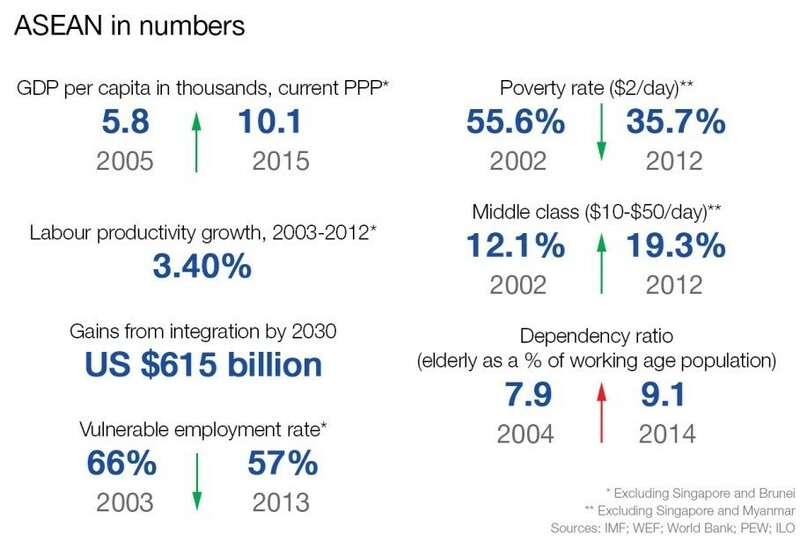 They have both grown rapidly over the past 15 years, with sub-Saharan Africa’s average growth of 5.5% outpacing that of the developing ASEAN countries growth of 5.1%: indeed they were two of the world’s fastest growing regions according to the IMF. Africa’s rapid growth since the turn of the millennium, which followed decades of stagnation, spurred discussions of an African century. It is clear that in recent years rising commodity prices, driven in large part by China’s seemingly insatiable desire for manufacturing inputs, provided a significant spur to growth across the developing world. This was felt strongly in African as well as ASEAN economies. Inputs such as Angolan and Nigerian oil, and Zambian copper fuelled China’s manufacturing boom. Fast forward to the present and the cooling of China’s growth has also cooled demand for African inputs, sending prices diving, and those countries most dependent on commodities reeling. 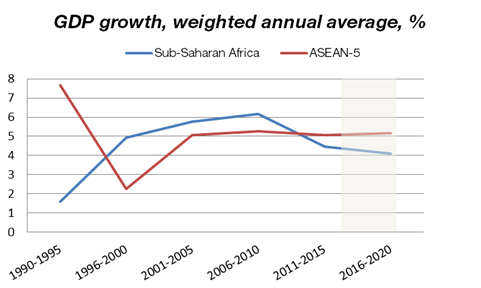 Yet while growth has slowed significantly in Africa over the past two years, and is stuck at 3% this year, developing ASEAN countries will still enjoy a comparatively brisk 4.7% growth rate. Taking a longer time perspective shows that this has been a more general trend. 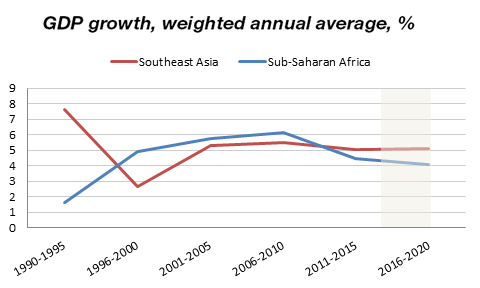 Going back to the 1990s, when comparable data for the two regions becomes available, one calculates that between 1991 and 2000, developing ASEAN countries grew on average 4.8%, compared with just 2.8% for sub-Saharan African countries. Looking at individual countries we can go back even further. For example, in 1980 Thailand and Malaysia’s GDP per capita in purchasing power parity terms were roughly similar to those of Kenya and the Republic of Congo, respectively. By 2015 there was an approximately fourfold difference. Among more advanced economies from the regions, in 1980 Singapore’s GDP per capita was less than twice that of South Africa. By 2016 it was more than six times larger. While precise comparisons are difficult, it would seem that there are three aspects of the ASEAN growth experience that can provide useful lessons for Africa for ensuring sustained growth in the years ahead, and providing rising living standards for citizens. First, ASEAN countries have made many of the reforms and investments needed for longer term prosperity. Whether looking at the World Bank’s Doing Business Indicators, or the World Economic Forum’s Global Competitiveness Report , measurable progress has been achieved across the region in tearing down red tape and putting the institutions, educational systems and infrastructure in place for well-functioning economies. Over the past four decades, ASEAN countries have improved their productivity by diversifying their economies rather than depending on fickle commodity prices. More than half of total growth since 1990 has come from productivity gains, as manufacturing became more efficient and as countries moved into services. This is not to say that no progress has been made in Africa, but it has progressed much more slowly . For Africa to grow sustainably, greater diversification and ease of doing business will be critical. Second, ASEAN economies have recognized that in a rapidly evolving global context they must join forces to reap economies of scale and are making brisk progress towards regional integration. While ASEAN regional integration is still incomplete, with internal trade lower than that in more mature regions like NAFTA or the EU, they are ploughing ahead in an effort to reap the estimated $615 billion in potential gains from integration by 2030. Integration efforts are of course underway in African regions such as the East African Community (EAC), the Economic Community of West African States (ECOWAS) and the Southern African Development Community (SADC). For both Africa and ASEAN, diversity in income levels and economic structures could facilitate the emergence of regional value chains and be an important spur to growth and development. Africa has much to gain by accelerating efforts towards integration. Thirdly, the role of expectations is also critical – a real belief in the future which makes investing in the present so compelling. It has long been understood that economic outcomes are in large part driven by the expectations of individuals. This requires a clear articulation by leaders in business and government about what they believe the future will look like. In much of Asia there is an inherent belief that countries will experience rapid economic progress - of course driven by past experience but also a general confidence in the future - and this tends to reinforce a positive self-fulfilling prophesy. Greater confidence in the future would be a boon in Africa, which is particularly at risk due to the present slowdown. Rwanda provides an intriguing example of how important this can be: the government has articulated a vision of Rwanda’s future as the region’s IT hub. This is driving many Rwandans to dream of a more prosperous future and to invest in the present, an important psychological break from the difficulties of the country’s recent past. Whether it is this particular dream or another that pans out in the future, the vision as laid out is fuelling positive expectations and indeed Rwanda’s economy is bucking the general trend of lower growth. This is not to say that everything is rosy in ASEAN countries. Much remains to be achieved, and countries such as Cambodia and Myanmar have a great deal of catching up to do to reach the levels of prosperity enjoyed elsewhere in the region. In this sense, despite great differences in size, the two regions have much in common. Perhaps most importantly both Africa and ASEAN must work towards a more inclusive growth process where much more of the population is able to participate in both the process and the outcomes of growth. By building institutions and infrastructure, tackling in earnest regional integration, and creating a true narrative in which citizens believe in a better future that they and their families will share in, there is every reason to believe that with political will a bright future awaits. The World Economic Forum on ASEAN is taking place in Kuala Lumpur, Malaysia, from 1 to 2 June.